Image courtesy of the Hornsby Library Collection, courtesy of Hedley & Del Somerville. 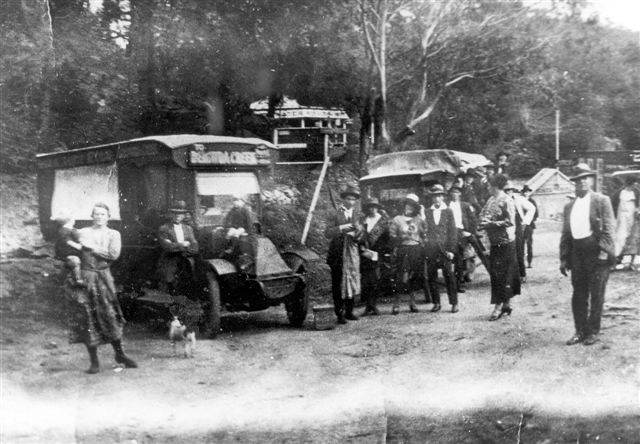 This interesting photograph from the 1920’s features W E (Billy) Wall great/grandson of Mary Wall with visitors at Berowra Waters. In the background is the Kiosk of his mother-in-law, Ada Foster Jones. The following extract is from An Entertaining Life -Memories of ‘Mr Don’ by Don Wall son of W E Wall. ‘..During my early childhood I can vividly recall watching my dad convert his tabletop truck from an ordinary vehicle into a bus.He would back the truck into a special stand,release the U bolts and by the use of jacks lift the tabletop off the truck’s chassis and secure it .He would then drive the truck out,minus the tabletop and reverse it into a nearby stand,where the bus top was in position,then lower it onto the truck’s chassis and secure it with U bolts.It was fascinating to watch the transformation. On completion of the exercise he would drive the bus to Berowra and transport weekend holiday-makers,mainly fishermen and people enjoying a day on the river,to and from Berowra Waters. The roads were not sealed and with solid rubber tyres,the bus trip was not as comfortable as we enjoy today. Everybody was in a holiday mood and after travelling to Berowra by train,boarded the bus,which carried about 30 people.The journey generated a lot of fun.On the Monday, following the weekend’s activities,he would reverse the process and use the truck for his transport business. .’..